Hey, look what I received from forwarded email. 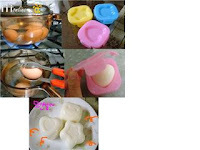 Moulded tray with fancy pattern for hard boil egg. SOooooo cute...please tell me can I get it locally? Don't tell me they only available in oversea country like Japan & Taiwan hor. If you know where can get it , do share me with me. Perhaps online stores did sell them, got to search online later. 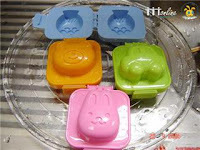 I am sure kids would love to egg once they saw the cute moulded tray!